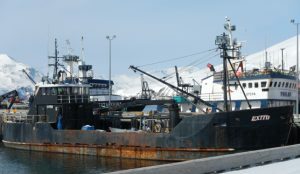 Two of five crewmembers are still missing after the 117’ EXITO sank 14 miles northeast of Dutch Harbor, Alaska on Tuesday evening, December 6. The owner of the EXITO called the Anchorage Coast Guard around 9:40 pm to report that the ship was taking on water and the crew was preparing to abandon ship. A Kodiak Jayhawk helicopter aircrew and four Good Samaritan ships in the area responded, according to Coast Guard Petty Officer Meredith Manning. “One of the Good Samaritan vessels, the AFOGNAK STRAIT, located three EXITO crew members and took them aboard their vessel,” Manning said. “The three had abandoned ship together, and the other two were preparing to abandon ship.” The AFOGNAK STRAIT crew rushed the three to Dutch Harbor. The rescued crewmembers reported that one of the missing EXITO crew had put on an immersion suit and was last seen preparing to abandon ship. Weather on scene is 8-foot seas and 25-35 mph winds. The cause of the EXITO taking on water and sinking is under investigation.